Upholstery and re-upholstery specialists, old furniture restored with new upholstery by master craftsmen. Bespoke, modern contemporary and antique period upholstered and wooden furniture restored and designed and built by Crowther and Sons , E W Crowther Ltd of Lincoln. Crowther and Sons specialise in hand-crafting upholstered furniture of exceptional quality. The family business was founded by Edward Crowther, over 30 years ago, on the enduring principles of excellence in design, quality of production and personal service. 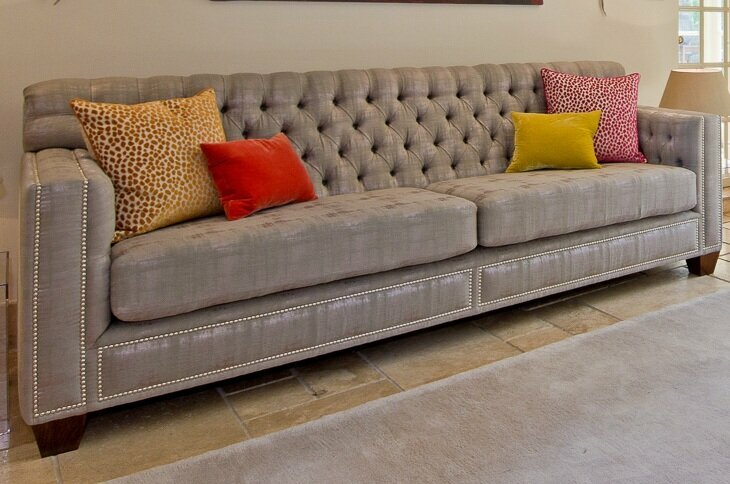 Each piece of furniture upholstered is bespoke and hand-built to an agreed specification. Our team of master craftsmen have a wealth of experience in a wide range of private residential and commercial projects throughout the United Kingdom. Introducing our new innovative range of healthcare sofas and chairs to make maintenance and cleaning easy. Recently reupholstered and restored this classic sofa including frame repair, goose feather cushions & intricate pattern matching. We were delighted to use one of our favourite @gpjbaker fabrics Nympheus linen an enduring design created by renowned British textile designer William Turner in 1915 a true classic. We are thrilled to have worked alongside Magari Interior Design in the recent refurbishment of the new Grille restaurant at The White Hart, Lincoln. "May we also say how much we appreciate your patience and help when we were trying to make up our minds on the fabric, the pattern and the cost. It was so refreshing to be able to take our time over what is a very difficult decision and one which we could not afford to get wrong.The end result is absolutely first-class and we are very grateful to you for all your help and professionalism." Mr & Mrs K. Pilbeam. To read more please visit our testimonials page.